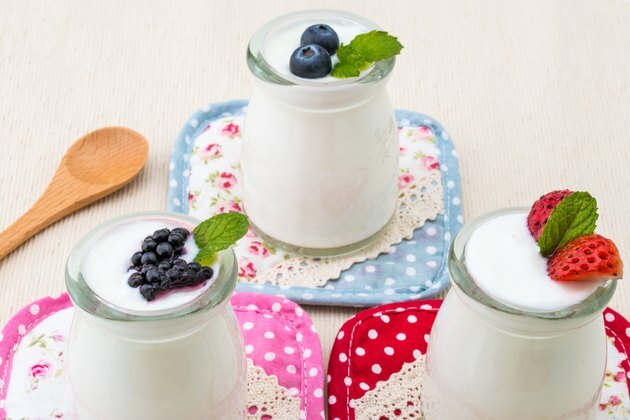 According to the U.S. Food and Drug Administration's standard of identity, making yogurt involves fermenting milk by adding live cultures of Streptococcus thermophilus and Lactobacillus bulgaricus bacteria. Soy yogurt does not contain milk and, therefore, does not meet the technical definition of yogurt, but both products provide a creamy texture and tangy flavor with significant amounts of protein and calcium. Adding specific bacteria to warm milk -- Lactobacillus bulgaricus and Streptococcus thermophilus -- gives yogurt its unique texture and flavor, according to the National Yogurt Foundation. Consumers can choose from an estimated 50 types and flavors of yogurt, including nonfat, low fat, full fat, fruit-on-the-bottom, plain and artificially sweetened versions. Yogurt's health benefits depend on the type of milk used and added ingredients. Instead of using cow's milk, soy yogurt manufacturers add live bacteria cultures to a creamy soy base made by removing the fiber from soybeans and blending the resulting mixture with water and cane sugar, according to Whole Soy & Company. Some companies use bacterial cultures grown on whey, a milk protein, while others use bacterial strains grown on a vegetable medium to produce vegan yogurt. Other variables include, but are not limited to, flavorings, sweeteners and fruit. Yogurt from either source provides a rich source of protein and calcium. An 8-oz. serving of regular yogurt contains 450 mg of calcium, or about 30 to 40 percent of the adult recommended daily allowance, as well as 10 to 14 g of protein, or about 20 percent of the adult recommended daily allowance, according to William Sears, M.D. The same serving size of plain soy yogurt contains 6 g of protein, or about 10 percent of the adult recommended daily allowance, and 40 percent of an adult's recommended daily allowance of calcium, according to the Silk Soy Milk. An 8-oz. serving of plain Silk soy yogurt contains 12 g of sugar, 22 g of total carbohydrates and 150 calories, according to the manufacturer's website. Added fruit increases the sugar and carbohydrate values. Blueberry soy milk, for example, contains 21 g of sugar and 29 g of total carbohydrates. Plain Greek yogurt, a strained version of milk yogurt, contains 90 calories, 9 g of total carbohydrates and no sugar, according to William Sears, M.D., but some milk yogurt manufacturers add so much sugar that the calorie value can climb to 200 to 300 calories and 17 to 32 g of sugar. Lactose intolerant individuals produce insufficient levels of lactase, the enzyme that helps to digest the milk sugar called lactose. As a result, they experience diarrhea, bloating, gas and abdominal pain after consuming milk products. Such individuals can often tolerate yogurt, however, because the bacteria helps to pre-digest the lactose. Consume vegan soy yogurt made without animal products if you have milk allergies. Soy yogurt contains no milk or lactose, but individuals allergic to soy may experience digestive symptoms, hives, swelling, wheezing or dizziness.